One of the basic concerns of therapists newly in private practice is how to deal with a client who, for whatever reasons, seems “beyond them”. Firstly, do ensure that you have put together a list of specialist agencies and organisations who can deal with problems presented to you that are outside your experience or preferred remit. It can be helpful to at least briefly touch on the nature of a client’s problem during the initial telephone conversation (where there is one), to give you an early opportunity to explain that you don’t deal with such particular difficulties, but you can recommend someone who can. Where you’re already in the process of therapy, and a difficulty arises, make your supervisor your first port of call. You may simply be experiencing a lack of confidence in dealing with the problem that your supervisor can help you through. It may also be that the client, now that he feels confident and trusting in you, would prefer to continue with you even though you’re not an expert in the area he has raised (drug abuse, for example) so he or she will also contribute to the decision you finally make. 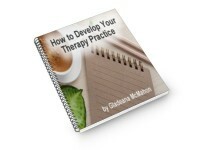 This post is part of the free E-Course “How to Develop Your Therapy Practice”. Each lesson only covers the bare essentials of what you need to learn and should not form your only source of information.